Do you live in Zamboanga City? The City of Zamboanga (Zamboangueño Chavacano Ciudad de Zamboanga) is a highly urbanized city located in Mindanao, Philippines. It has a population of more than 807,129 according to the 2010 census. Zamboanga is the 6th most populous and 3rd largest city by land area in the Philippines. It is the commercial and industrial center of the Zamboanga Peninsula. 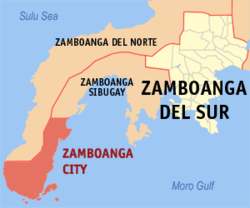 Zamboanga was formerly known as Jambangan in Subanon and the center of Subanon tribe and culture during the pre-Hispanic times. After independence from Spain on May 1899, Zamboanga became the Republica de Zamboanga with Zamboangueño Chavacano as its official language and Spanish as its co-official language. After American intervention, the republic incorporated into the Philippines and became the capital of the former Moro Province, now Mindanao, from 1903 to 1913. On October 12, 1936, Zamboanga became a chartered city under Commonwealth Act No. 39. It was formally inaugurated on February 26, 1937, which was declared a local holiday. Known for Hispanic influences in its culture, it bears the nickname "Asia's Latin City." 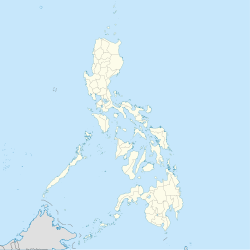 Map showing the location of Zamboanga City.